Welcome to our church - we invite you to look around and get a feel for things. If you're not currently a member of our church, we'd like to take this opportunity to remind you that all non-believers burn in hell for eternity and to invite you to one of our weekly services. We hope you and your family will have a warm and spirit-filled experience with us as we worship and also find great fellowship together as we indoctrinate our children to feel fearful, ashamed and guilty for something they had no involvement in. Please come and join us on our social media sites (Twitter, Facebook & YouTube) where the irony of the fact that the internet was invented by a homosexual atheist is entirely lost on us. Or you can contact us for other inquiries. 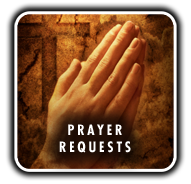 We'd also like to invite you to make an online prayer request. Your prayer request opens the door and God is waiting patiently on the other side at all times, in all situations, to grant your wishes. Or do something you weren't expecting. Or ignore you completely. Don't worry - it's all part of his plan and we've never heard of confirmation bias.